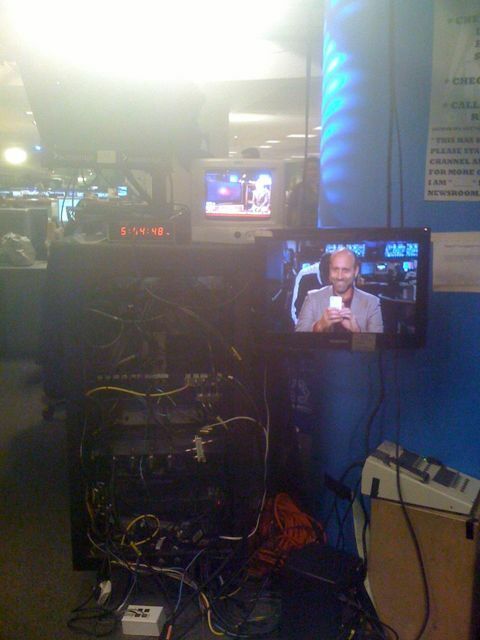 If you’ve ever wondered what TV’s talking heads are looking at during satellite interviews, this is it. This is Fix News in New York City. I get an earpiece and I stare at the black glass plate under the bright light. I can see the time and myself (and at this hour, another monitor showing Glenn Beck’s show, on air nearby), but I dare not look away from the blank glass, or I’ll come across as nervous and shifty. There is never a script or a prompter. Surprised they didn’t already make ya take it down! BTW… Your host reel is great… peace! The rank and file are actually very nice there. The stage manager, or whatever you call him, even offered to take a pic with me in the chair.